Importing Skus from Bigcommerce into AmberPOS – Pacific Amber Technologies Inc.
You will need to access the webstore mass integration screen to import skus from Bigcommerce into AmberPOS. Ensure that the tab is selected and then click on . From the options that appear choose the last one . When the window opens select the tab . This will display items that are on Bigcommerce that don't exist in AmberPOS. 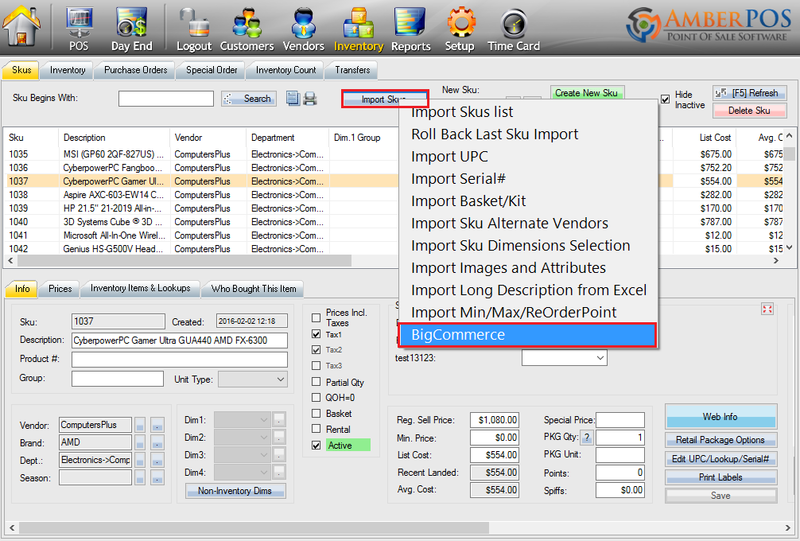 Select the SKU cell for items which you want to import into AmberPOS and be linked. You can select a group of items by holding down the shift key and clicking down the list, or holding down the Ctrl key and clicking on multiple items. After selecting the cells you can click on . If the item correctly populates in AmberPOS you will see a message like the one shown below. Once the item has populated it's data locally in AmberPOS you will want to re-upload AmberPOS data for the item onto Bigcommerce. This will ensure that any item structure that is required to populate in AmberPOS will populate online for the linked item. Navigate to the tab and select the cells for items you want to push AmberPOS data for online. Click on on the bottom of the screen and you should see a successful upload message like the one shown below. 2) select the item(s) that you want to upload. 3) Choose the button to push the item data onto Bigcommerce. 4) Results of the upload will be displayed. When you import sku data from Bigcommerce into AmberPOS pay close attention to item variations if the product uses options. Notice how the item has options online though there are no variations to the product. This means that it would import into AmberPOS as a non-inventory dimension. If you prefer to track history for each of the variations of the the item then make sure you generate those values on Bigcommerce before importing the item into AmberPOS. 1) Find the item on your bigcommerce website and choose to edit the item. Choose the "Options" tab while editing the item. 2) Click on the SKUs tab and you will see whether the item has item variations online. 3) Click the "Generate SKUs" button to create the item variations so that when sold it will track that item variation code to the sale of the item on Bigcommerce. Consult Bigcommerce support if you need more information about using their website.